During one of my consulting engagements, I had the privilege to lead a group of truly world-class design engineers, many holders of multiple bleeding-edge high-tech patents. Each of these engineers had, by virtue of their intelligence, hard work and hard knocks, achieved the status of ”program manager” for High Tech Manufacturer (an alias). High Tech Manufacturer is one of literally hundreds of suppliers, contractors and sub-contractors involved in creating one of the most complex products on earth. For all the brain power in the room, these program managers had missed multiple commitment dates to supply their component parts to the primary customer, High Tech Assembler. The missed dates caused the loss of millions of dollars in overruns for High Tech Manufacturer and penalties and lost revenue for High Tech Assembler. Most importantly, High Tech Manufacturer lost its position as prime component supplier to a competitor on High Tech Assembler’s next generation of product. Not all program management needs are this central to a core enterprise process, nor are the consequences of poor program management in every instance this clear cut. However, this is a perfect illustration of what is needed- A way to manage a complex, discrete initiative to achieve a desired business outcome with very high consequences of failure. For High Tech Manufacturer, we developed a flexible framework to help organize, plan and support how the work was to be accomplished, a Program Management framework which creates an environment to make project management decisions for the individual projects, the building blocks of programs. Just as with project management, we only add as much structure as we need to manage our risks. This is where the flexibility is central to project and program thinking. If we start at the center of the framework, we begin with the definition of project management- the continuous management of the trade-offs between scope, schedule and resources. 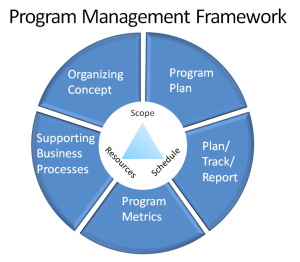 For each and everyone of the individual projects which makeup a program, the program management framework provides an environment to make those trade-off decisions. The Program Plan relies on an overall integrated schedule (a road map), a budget for all resource requirements, a definition of scope and a detailed work breakdown structure to ensure delivery of the business objectives. Additionally, the plan includes a risk management plan, staffing plan, and necessary change management toolkit (e.g., communication plan, stakeholder analysis, etc.). The formalization of the review process should be integrated with the approval and commitment documents. Plan/Track/Report represent key actions taken relative to the program metrics each focused on scope, schedule and/or resources of the work breakdown structure at periodic and milestone events. For example, daily informal reviews and discussions by project and program manager, to keep on track, versus quarterly or milestone formal reviews, including senior management and consideration of reallocation of resources among projects and programs. Program Metrics quantify what is to be accomplished and consumed. Again, utilizing the underlying elements of scope, schedule and resources, targets are estimated for work package delivery and rolled-up (e.g., estimate at complete). Additional metrics may be related to specific risks identified in the risk management plan. Supporting Business Processes ensures supporting business systems and interaction mechanisms with sponsoring or involved organizations. For example, ensuring payment of cross-functional talent on extended programs is an important business process, yet time and again a most difficult issue to address in many traditionally siloed organizations. Another example of a surprisingly difficult area tends to be housing a co-located team, which can grow to be rather large on strategically critical initiatives. Organizing Concept defines the members of the program team and outlines roles including sponsor role (typically supported by coaching an assigned executive on “how to” sponsor), ARCI charts, approval thresholds, functional quality control, work-streams, etc. This clarity in roles extends to how roles change throughout the program’s life-cycle. Without traditional organizational structure is is critical to explicitly define behavioral, performance and reporting relationships and norms. 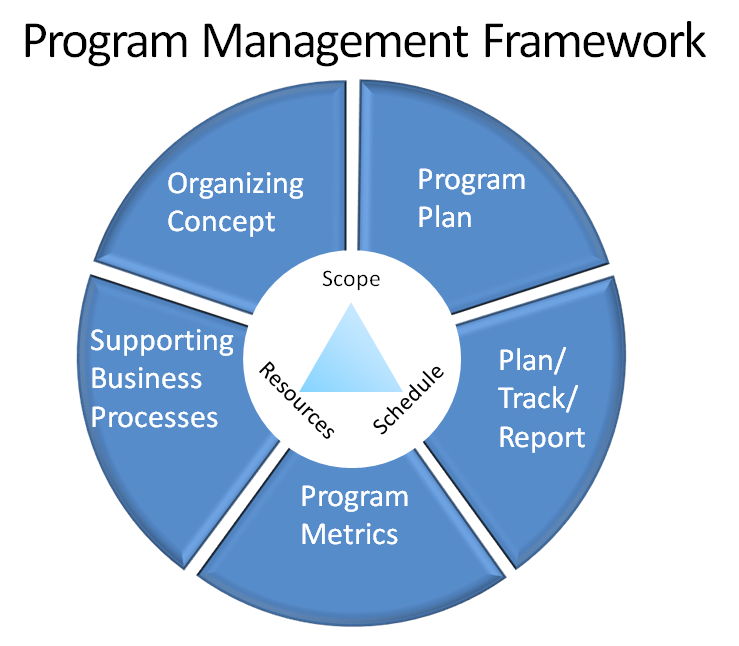 Management of a program is most effective if all levels of management (from work package manager up to sponsors) work through some basic, common beliefs and frameworks. My recommendation for discrete initiatives, like building a specific strategic capability, is project management flexibly layered with just the amount of structure to facilitate the natural and necessary discussions and decisioning throughout the organization. This note has been informed by previous work of the author. See Reeder, Thomas J. (1995), “Take a flexible approach”, Industrial Engineering, March, pp 29-35.